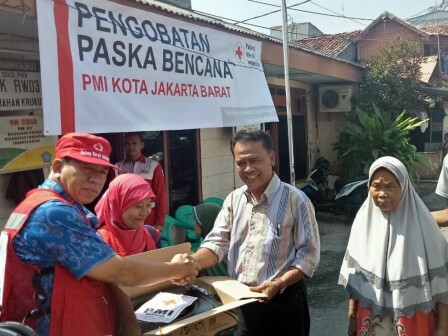 Jakarta Indonesian Red Cross (PMI) distributed aid to fire victims which are the residents of RW 03, Krukut Urban Village, Taman Sari. Jakarta PMI gave 300 stoves and free mass medical treatment.
" In this chance, medical team also holds free mass treatment for local residents"
West Jakarta PMI Head, Baharudin said, his side distributes 300 stoves, one-gas stove, and free mass medical treatment. "We hope this aid can be useful for residents,"he expressed, Thursday (3/15). He added, formerly Jakarta PMI has distributed food, beverages, and building materials. "In this chance, medical team also holds free mass treatment for local residents," he conveyed. For information, there are at least 240 families in 7 RTs of RW 03 Krukut Urban Village who lost their houses due to fire incident on Saturday (1/27).